Mary Gates was a leader who promoted voluntary service and philanthropy both locally and nationally. A member of the UW Board of Regents from 1975-1993, Mrs. Gates had a deep and abiding interest in students, particularly undergraduates, and consistently raised issues to ensure that student concerns were addressed. Mary Gates Hall commemorates Mrs. Gates’ commitment and honors the public/private partnerships that support higher education in Washington state. A member of the UW Board of Regents for eighteen years (1975-1993), Mrs. Gates was a remarkable person, a leader who promoted voluntary service and philanthropy, both locally and nationally. 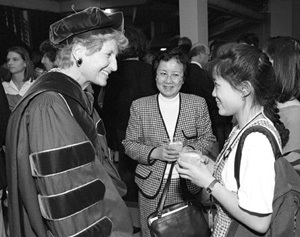 At her memorial service in June of 1994, then-UW President William P. Gerberding spoke of her capacity for “infectious, effervescent joy,” and her “largeness of purpose and spirit.” “She was a luminous presence and a powerful influence at this University and in the community,” said Gerberding. A graduate of the University of Washington (50), Mrs. Gates had many connections to her alma mater: both of her parents were alumni. She met her husband, William H. Gates, Jr. (49, 50), when both were UW students. One of their three children graduated from the University of Washington (Regent Kristi Gates Blake, 75). At a time when women’s roles in society were changing rapidly, Mrs. Gates brought leadership to a broad spectrum of community endeavors including education, the arts, government, health care, and major corporations. In addition to being a Regent of the University, she served on the UW Foundation Board of Directors, the UW Medical Center Board, and the School of Business Administration’s Advisory Board. Her volunteer roles in Seattle and King County included serving on the boards of the Children’s Hospital Foundation, Seattle Symphony, Greater Seattle Chamber of Commerce, United Way of King County, and many other nonprofit organizations. Mrs. Gates’ leadership was not limited to the nonprofit world. She served for many years on the boards of directors of major corporations: First Interstate Bank of Washington; Unigard Security Insurance Group; Pacific Northwest Bell Telephone Company and later US WEST Communications; and KIRO Incorporated television and radio stations. Mrs. Gates’ work with United Way of King County (1974-1988) brought her national recognition. 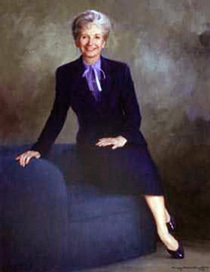 Appointed to the board of directors of United Way International in 1980, she was the first woman to chair that board (1985-1987). In the state of Washington, Mrs. Gates was known for her leadership of Washington Gives — an organization that promotes philanthropy and volunteering. In 1991, Washington Gives honored Mrs. Gates, her husband Bill, and their children Kristi, Bill III, and Libby as Philanthropic Family of the Year. For her service to the University and the community, Mrs. Gates received the 1994 University of Washington Recognition Award. In 1994 she also was recognized by the Municipal League of King County as Citizen of the Year.